Summary: When Adrianne comes face-to-face with the mermaid of Windwaithe Island, of whom she has heard terrible stories all her life, she is convinced the mermaid means to take her younger sister. Adrianne, fierce-willed and courageous, is determined to protect her sister from the mermaid, and her family from starvation. However, the mermaid continues to haunt Adrianne in her dreams and with her song. 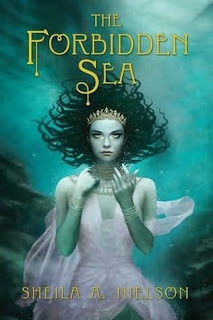 Yet, when the islanders find out about Adrianne's encounters with the mermaid she is scorned, for this small and superstitious community believes the mermaid will bring devastation to the island if Adrianne does not give herself to the sea. A powerful and lyrical story of one girl who must choose between having everything and having those she loves. I love mermaid tales, I'd love to read this one. This one sounds good! Thanks for the giveaways! Please enter me! Thank you for the contest! Great cover. Sounds like a great book! Enter me please! I love mermaid stories! I met the author, and she seemed super nice! I'd love to read this one. Sounds like a great mermaid story!